Reel Talk Online: Early Review: "Thor"
"The answers you seek shall be yours, once I claim what is mine." The classic comic book story of the god of thunder Thor hits the big screen this weekend to battle it out with the current box office champion--and fellow popcorn flick--Fast Five. And, you know what? It's kinda good. 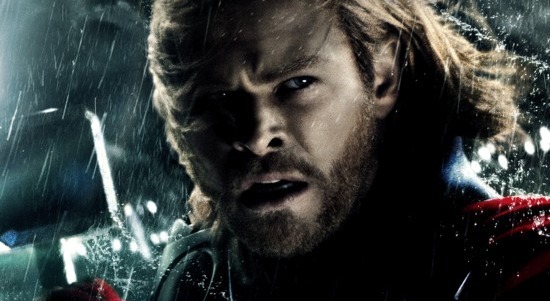 Witty, charming and very current, the big screen adaptation of Thor is sure to catapult its star Chris Hemsworth (whose wife, Elsa Pataky, ironically stars in Fast Five) to leading man status. If you're a comic book junkie, you may know that the almighty Thor is all set to take over the land of Asgard from his elderly father Odin (Anthony Hopkins). But then he starts showing off, in a beautifully orchestrated showdown in the Frozen Land, consequently getting himself, his brother Loki (Tom Hiddleston), and their posse in deep you-know-what. Daddy Odin begrudgingly intervenes and saves the day, but later exiles Thor from the land after stripping him of mjöllnir and the rest of his powers. Where does he end up? On Earth, powerless, and totally out of his element. Desperate to return to his realm, Thor seeks solace with a group of geeks, um, scientists played by Natalie Portman, Stellan Skarsgård, and Kat Dennings, who gives him a real lesson in humility. Hemsworth makes what could have been a silly plotline--complete with cheap medieval references in the modern world--and makes it really entertaining. But the major plotline, the volatile relationship between Thor and Loki, whose taken over as king of Asgard, is most intriguing (in part due to the captivating performance by Middleston). There's a terrific faceoff between the two that's dramatic, over-the-top and popcorn delicious, leading up to a nice setup for next year's The Avengers. Thor doesn't try to be take itself too seriously or be more than what it is (really, a guy in search of his magical hammer), but it remains engaging throughout with comedic clips from not only Hemsworth but Dennings with excellent special effects. If your mom wants to steer clear of the generic romantic comedies coming out this weekend, take her to see Thor on Mother's Day. Simply because it's a darn fun watch led by a fantastic cast. Very well written review. I am expecting to feel about like you did with the film. he takes matters into his own hands, traveling to the Frost Giant's realm with his brother Loki (Tom Hiddleston), and compatriots Sif (Jaimie Alexander), Volstagg (Ray Stevenson), Hogun (Tadanobu Asano) and Fandral (Josh Dallas) in tow. When the encounter with the Frost Giants ends with tensions re-ignited between the two factions, Odin decides that his son is not prepared to lead his people, and exiles Thor, sans his powers, to Earth.